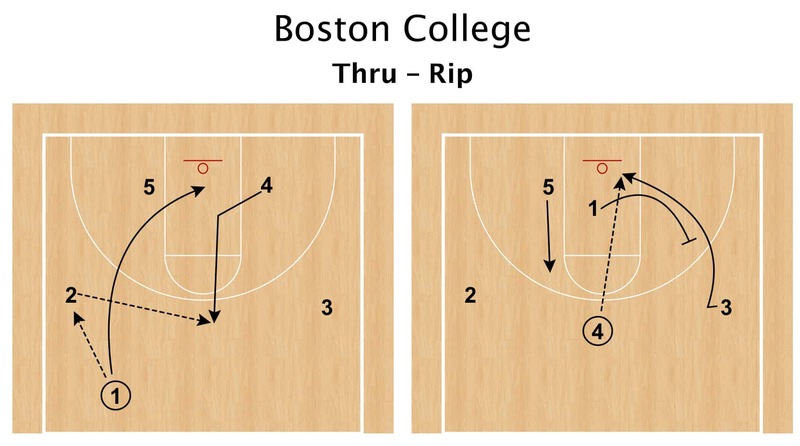 This set from Boston College is good action to get some basic movement into a backscreen for an athlete. This is a basic counter out of their through series in which the point guard cuts through the lane opposite. What I really like about this set is the lob man starts out extremely high on the wing and sprints into the backscreen looking for a lob. As we can see in the video, the point guard passes to the wing and cuts through the lane. The opposite big (4 man) lifts to the sweet spot in the middle of the floor and receives a pass for a ball reversal. As the ball is being reversed the 5 man steps up and empties the paint almost like he will go and set a ballscreen for the ballhandler. The point guard then continues through and sets a backscreen for the opposite athlete on the wing for a lob. This is a similar set the Houston Rockets run, however the Rockets run it into a dribble hand off and not looking for the backscreen as often. Having a player set a backscreen before receiving a dribble hand off or a ballscreen is a great way to get them open – even in a motion offense. What I am taking away from this set is that every time we have a chance we should try and backscreen, especially when looking to get yourself open.